Diagnostic Features - Pedicel of two segments with the postpetiole distinctly separated from the gaster. Frontal carinae partially covering the antennal insertions. Antennae always 12-segmented. Eyes well developed, usually large, and ocelli often present. Clypeus not projecting back between frontal carinae. Tibial spurs of middle and hind legs pectinate. Claws usually toothed. Ward (1990) covered Tetraponera, the previous Pachysima Emery and Viticicola Wheeler and Sima Roger. The synonymy within Tetraponera is recognised also by Bolton (1994, 1995). Diagnostic Features - Slender elongate ants with relatively short legs. Clypeus sometimes produced into a spine or armed with a row of teeth or with a crenulate anterior margin. Either petiole alone with a ventral process or both segments without ventral processes. F Smith's (1852) genus definition is at . [Smith, F. 1852. 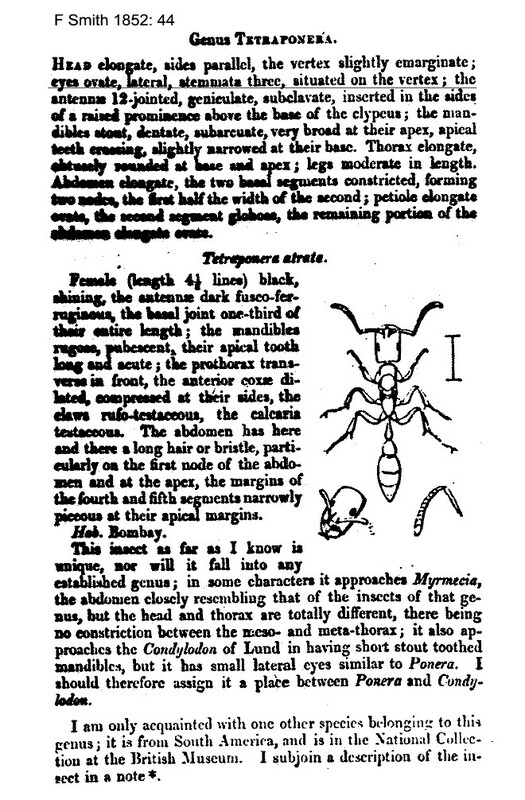 Descriptions of some hymenopterous insects captured in India, with notes on their oeconomy, by Ezra T. Downes, Esq., who presented them to the Honourable the East India Company. Ann. Mag. Nat. Hist., (2)9, 44-50]. 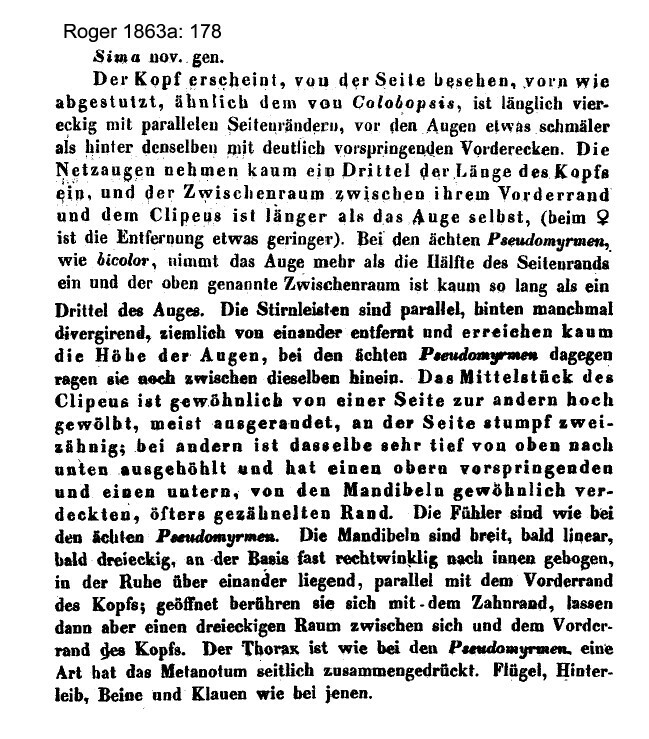 Roger's (1863a) definition of Sima is at . All are arboreal species and very active, with characteristic rapid, jerky movements, and abrupt changes of direction. The previous Pachysima and Viticicola were characterised because of their habit of living inside plant stems, sometimes as commensals, Pachysima in plants of the genus Barteria and tending large coccids on the plants. Hölldobler & Wilson (1990, page 535) describe the protection provided by Tetraponera (as Viticicola) tessmanni, which live only in stems of the liana, Vitex staudtii Guerkel; and by Tetraponera (as Pachysima) aethiops for Barteria fistulosa in Zaïre; they also list the incidence of Tetraponera ledouxi as a temporary parasite of Tetraponera anthracina (page 438, and Terron, 1969); and how one species, Tetraponera nasuta, uniquely has a major caste with unknown functions (Terron (1971). Earlier, Bernard (1952) remarked how all genus members inhabit hollow stems or dead wood and some support specific plants. From Africa, he reckoned there were some 30 species, with many still to be found. Alitrunk in lateral view undulate; few erect hairs on body - Tetraponera erythraea (see below). The sole record for the latter, however, was the original description (Emery, 1895) from Aden, a curious misnaming of a species that apparently was not from Eritrea.